Here is a spotted-tailed quoll looking for prey to catch. Today I want to write about a really cool species of marsupial, the spotted-tailed quoll. Also known as tiger quolls, these guys grow up to 1 metre long (including their tail), making them the largest of the six species of quoll and the longest carnivorous marsupial in the world. Spotted-tailed quolls hunt at night and are excellent climbers. They have very strong jaws and sharp teeth, using them to hunt small marsupials and other mammals, reptiles and birds. If they catch prey or find carrion that is too big to eat in one night, they go back day after day until it is all eaten. They only live for about 3-4 years, so they have large litters of about 6 babies every year to keep their numbers up. 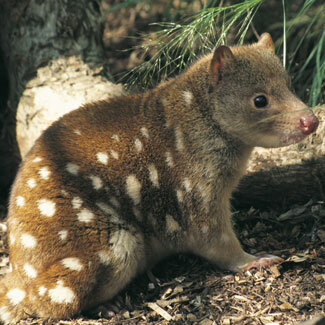 Spotted-tailed quolls are found in rainforests and eucalyptus forests along the east coast of Australia and in Tasmania. They are vulnerable to extinction due to habitat loss and competition from introduced predators such as cats, dogs and foxes. Are there any other interesting facts that you would like to share about spotted-tailed quolls?